July 22, 2011 by Ken Ward Jr.
Vicki Smith over at The Associated Press has been up in Wheeling the last few days covering pre-trial hearings in the big coal slurry pollution case against Massey Energy by the residents of about 700 Mingo County residents. For the third time, two judges will try to settle a long-running lawsuit that claims Massey Energy Co. and one of its subsidiaries poisoned hundreds of drinking water wells in southern West Virginia with coal slurry. The state’s Mass Litigation Panel is handling the case against Massey and subsidiary Rawl Sales & Processing, both of which are now owned by Virginia-based Alpha Natural Resources. Judges Derek Swope and Alan Moats have ordered lead attorneys for both sides to meet July 25-26 in Charleston to discuss a possible deal and avoid the series of trials set to begin Aug. 1 in Wheeling. A three-judge panel refused Thursday to dismiss a lawsuit accusing Massey Energy of poisoning hundreds of southern West Virginia wells with coal slurry, but it denied a request to sanction the coal operator for taking years to produce maps of its underground injection sites and other evidence. After a contentious daylong hearing in Wheeling, the judges began clearing the way for the trial, set to begin Aug. 1. They also laid out rules for that trial, ordering participants to stop talking to the media, denying video coverage of the proceedings and warning against signs, buttons, T-shirts and anything else that attempts to turn the Ohio County Circuit Court into a protest venue. The plaintiffs asked for sanctions against Massey, claiming it withheld maps, financial records and other evidence they requested nearly seven years ago until last month, when a new court order compelled them to search a mine map vault in Kentucky. In that vault, investigators found maps in unmarked storage bags. But plaintiffs’ attorney Kevin Thompson said his team found even more documents in the attic Wednesday, and they plan to keep searching. The maps contain information about the location of injection bore holes, how long they were used and other facts the plaintiffs consider critical to their case. Three judges hearing a coal slurry pollution lawsuit against Massey Energy are considering Friday whether the parent corporation should be held liable for the actions of a subsidiary it claims operated independently. 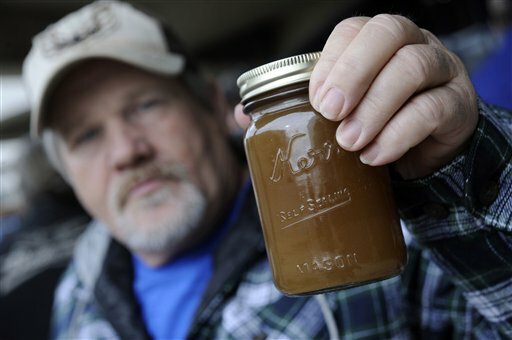 Massey contends that Rawl Sales & Processing, the company accused of poisoning hundreds of southern West Virginia wells by pumping slurry underground, had its own managers, board meetings and finances. Ownership and a shared interest in success are not enough to hold Massey responsible for everything Rawl did, argues attorney Jon Anderson. But lawyers for some 700 Mingo County plaintiffs say former Massey CEO Don Blankenship “cut his teeth” at Rawl and remained intimately involved in all his companies as he rose through Massey’s ranks. Blankenship was Rawl’s comptroller in 1984 and was busting unions for Massey by 1982. “He learned at Rawl that he had to determine how far he could stretch the operations of the company before the law beat you back,” said attorney Van Bunch. Rawl is also where he first demonstrated his hands-on management style, Bunch and fellow attorney Bruce Stanley argued. Since September 2004, approximately 738 plaintiffs have filed approximately 400 suits against us and our subsidiary, Rawl Sales & Processing Co., in the Circuit Court of Mingo County, West Virginia (“Mingo Court”), for alleged property damage and personal injuries arising out of slurry injection and impoundment practices allegedly contaminating plaintiffs’ water wells. Plaintiffs seek injunctive relief and compensatory damages in excess of $170 million and unquantified punitive damages. Specifically, plaintiffs are claiming that defendants’ activities during the period of 1978 through 1987 rendered their property valueless and request monetary damages to pay, inter alia, the value of their property and future water bills. In addition, many plaintiffs are also claiming that their exposure to the contaminated well water caused neurological injury or physical injury, including cancers, kidney problems and gall stones. Finally, all plaintiffs claimed entitlement to medical monitoring for the next 30 years and have requested unliquidated compensatory damages for pain and suffering, annoyance and inconvenience and legal fees. On April 30, 2009, the Mingo Court held a mandatory settlement conference. At that settlement conference, all plaintiffs agreed to settle and dismiss their medical monitoring claims. Additionally, 180 plaintiffs agreed to settle all of their remaining claims and be dismissed from the case. All settlements to date will be funded by insurance proceeds. Plaintiffs challenged the medical monitoring settlement. There are currently 585 plaintiffs with individual claims. A number of motions that could impact the number of Plaintiffs and scope of the issues of these suits are pending. The West Virginia Supreme Court issued an administrative order transferring the cases to the Mass Litigation Panel. Mediation of all pending suits was held on February 22-23, 2011 in Charleston, West Virginia. The mediation resulted in the final settlement of all medical monitoring claims and disposed of Plaintiffs’ earlier challenge of the prior medical monitoring settlement. The medical monitoring claims will be paid by insurance proceeds. No other claims were resolved. A previous mediation conducted in November 2010 was unsuccessful. A trial date has been set for August 2011. Beginning in December 2008, we and certain of our subsidiaries along with several other companies were sued in numerous actions in Boone County, West Virginia involving approximately 374 plaintiffs alleging well water contamination resulting from coal mining operations. The claims mirror those made above in the separate action before the Mass Litigation Panel, as described above. The separate civil actions have been consolidated for discovery purposes with trial for 266 plaintiffs scheduled for October 25, 2011. No trial date is set for the remaining approximately 108 plaintiffs. We do not believe there was any contamination caused by our activities or that plaintiffs suffered any damage and we believe that we have strong defenses to these matters. We plan to vigorously contest these claims. We believe that we have insurance coverage applicable to these matters and have initiated litigation against our insurers to establish that coverage. At this time, we believe that the litigation by the plaintiffs will be resolved without a material adverse impact on our cash flows, results of operations or financial condition.